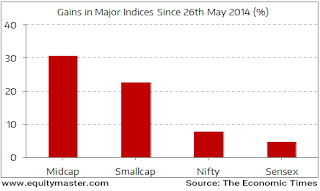 Home > News - May 2016 > Midcap and Smallcap Stocks the Best Performers in 2 Years of Modi Govt. Midcap and Smallcap Stocks the Best Performers in 2 Years of Modi Govt. Midcaps the Best Performers in 2 Years of Narendra Modi Govt. The Sensex has given up almost all of its gains since then and is up a mere 5% at the end of Modi's 2 years at the helm. While mid and small cap stocks have also had some sort of a reality check, their point to point gains of 31% and 23% respectively are still looking good.